Now that summer is in full swing, we look back at the ways New Yorkers have either escaped or embraced the heat. The Drive in Central Park was a place to see and be seen, particularly for the wealthiest New Yorkers, who dressed in their finest attire and rode carriages through the park. At the turn of the century, long black stockings typically accompanied women’s bathing suits (or bathing gowns, as they were called). Bathing suits became less restrictive a few years later, when women began participating in competitive swimming. Before air conditioning, it was not uncommon for tenement dwellers to put their mattresses on the roof and sleep through the season’s hottest nights. The Jackie Robinson Pool originally opened as the Colonial Park Pool in Harlem on August 8, 1936. It was one of 11 swimming pools opened throughout the city that year and funded by the Works Progress Administration (WPA), a New Deal agency created to combat the Great Depression. Some New Yorkers preferred water hoses to swimming pools. Every summer, Coney Island’s boardwalk bustles with city dwellers seeking a respite from the heat. Nathan’s Famous opened in Coney Island at Surf and Stillwell Avenues in 1916, where it still stands today and attracts scores of New Yorkers and tourists alike. Coney Island’s Steeplechase Park began hosting an annual poolside beauty contest called Modern Venus in 1913. Beauty contests flourished as bathing suits became skimpier. 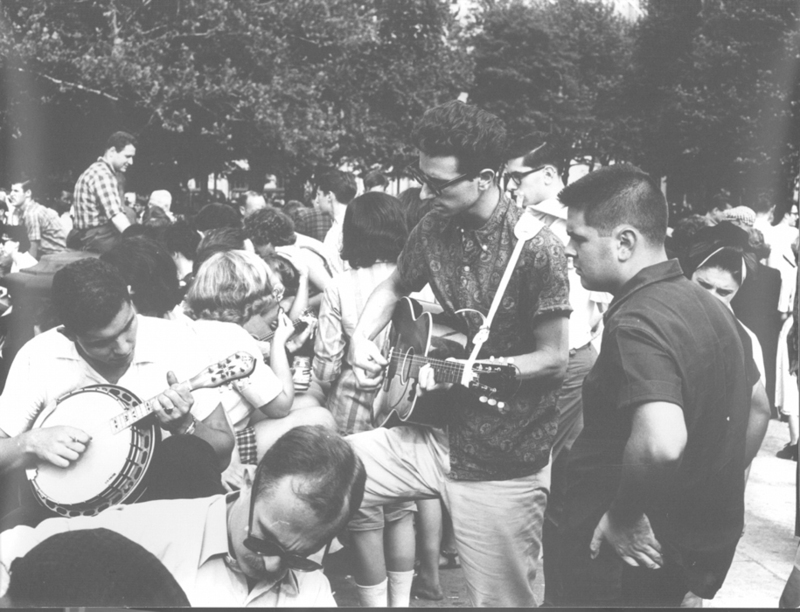 After World War II, folk singers began congregating in Washington Square. The singers and their audience clashed with some residents of the neighborhood, who thought they were a nuisance. In 1947, the New York City Department of Parks & Recreation started issuing permits for public performances in city parks. In 1961, Parks Commissioner Newbold Morris rejected folk singers’ applications to play in Washington Square. Protests ensued, culminating in a fight between the musicians and their supporters and the police seeking to clear the crowds. In the end, a compromise was reached, with folk singers being allowed in the park on Sunday afternoons. 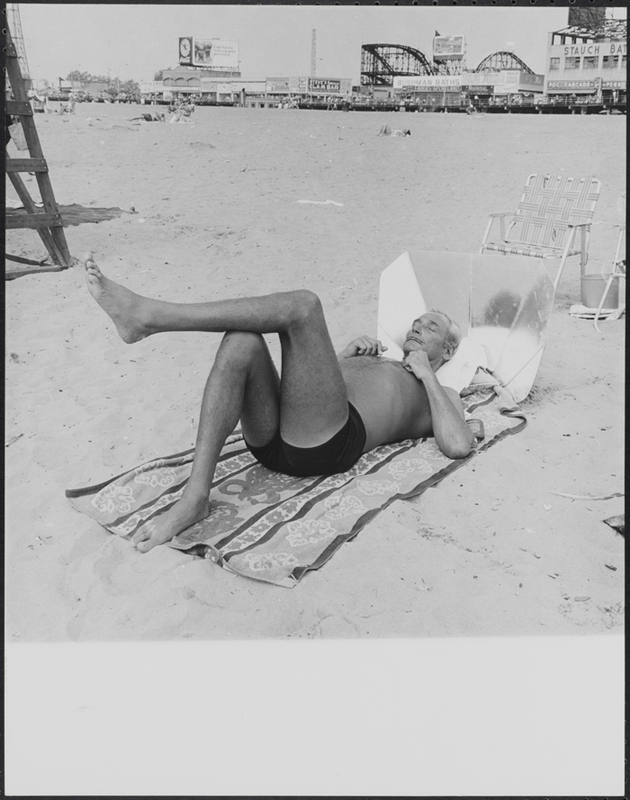 Some people, like the man below, embrace the “if you can’t beat the heat, join it” philosophy. 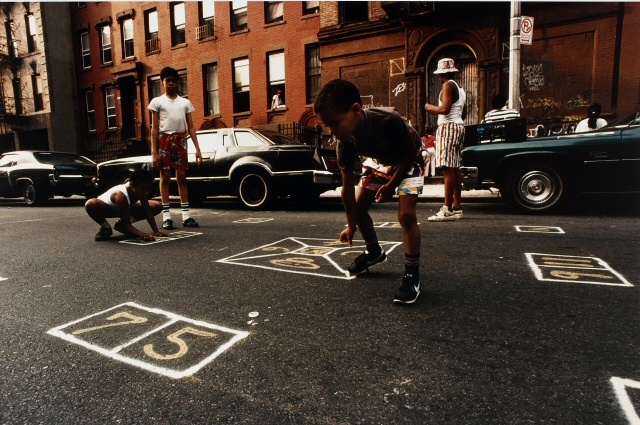 Skully, also known by variants like “skellie,” is a children’s street game played with bottle caps. Its popularity among youth began to fade in the 1980s. A telltale sign that summer has arrived is hearing the music from ice cream trucks. 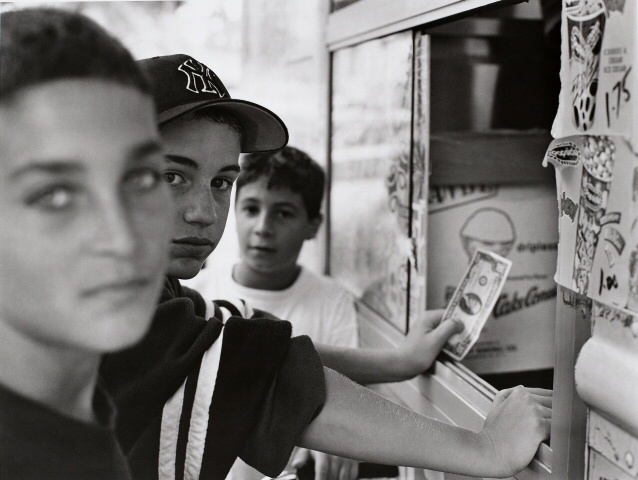 Ice cream vendors have used noise to attract customers since the late 1800s. But not everybody welcomes the familiar melody of ice cream trucks. In 2005, Mayor Michael Bloomberg attempted to ban the music in the city’s noise code. An outright ban was unsuccessful, but now vendors are only allowed to play music when their vehicle is in motion. This entry was posted on July 10, 2012 by Lauren Robinson in Digital Project, Photography Collection, Print Collection and tagged Amusement parks, Beauty contests, Bronx, Brooklyn, Central Park, Coney Island, East Harlem, Harlem, Manhattan, Midland Beach, Nathan's Famous, Orchard Beach, Shuffleboard, Skully, Staten Island, Steeplechase Park, Street games, Summer, Swimming, Washington Square.